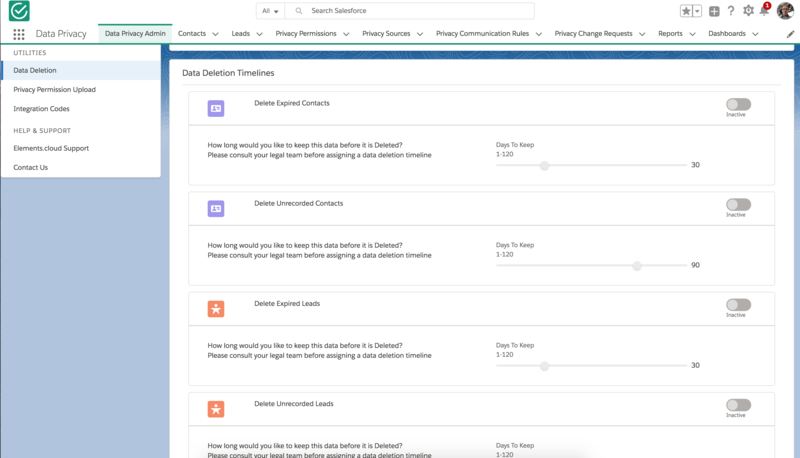 Data Privacy Manager supports the data lifecycle by allowing rules to be applied to contacts and leads, which will result in these items being deleted. By default, the deletion management capability is off in the App. Enabling the Data Deletion capability will enable the recording of any contact or lead that is deleted in the delete history. Enable the facility using the switch in the Data Deletion and on the Data Deletion Preferences section. With this enabled, any lead or contact which is deleted will have these details stored so they can be subsequently queried. This applies to manually deleted records as well as automatically deleted records if this capability is subsequently enabled. Each case can be individually enabled and the period of time after the record enters that state that the deletion will occur. The value is between 1 and 120 days. It is possible that records cannot be deleted due to Salesforce rules. In this case, the record will not be deleted. For example, if a contact currently owns a case, their record cannot be deleted. The App allows a search to be conducted across the data that has been deleted. It returns the number of records that match the search based on email, first name, last name, and postal code. It shows the type and when the record was deleted.